Electronic access control can provide an efficient and convenient way of securing a residential building instead of using traditional locks and keys. Tokens are issued to allow access through the controlled doors and can be blocked easily if they are lost or stolen. Blocked tokens will then not allow access through a controlled door. 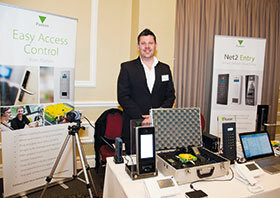 Access control offers flexible control over users’ access rights too. For example, all residents can gain access through the main door of a building, while at the same time specific areas could be managed with higher security by setting varying permissions depending on each user. Visitors can be granted temporary access rights, for example contractors working on the site, with the permissions set to expire once their work has been completed. If you are looking to extend building security beyond access control, it is also possible to integrate networked access control with video door entry systems, CCTV, fire and intruder alarms. With over 30 years’ experience, Paxton is a market leading designer and manufacturer of IP access control and door entry systems. Our products harness the latest technology to provide powerful, yet easy to specify and install solutions. Paxton’s Net2 system is a user-friendly and flexible networked access control solution that is designed to make the management of any building incredibly simple. Sitting directly on a building’s network and managed via a central PC, it allows a building concierge, caretaker or managing agent to manage security from one central platform, making administration straightforward. Comprising smart, simple door hardware and advanced, yet easy to use software, Net2 moves beyond the basics of securing access to doors to provide features like energy saving, system integration, building management and security lockdown. Net2 Entry, Paxton’s award-winning video door entry solution is a simple security solution that allows you to identify and authorise a visitor before they can gain access into a building. It is easy to use and comes in a stylish, discreet design, offering a flexible and high security solution that suits a range of environments including residential complexes. For more information contact Paxton, +27 (0)21 427 6691, support@paxtonaccess.co.za, www.paxtonaccess.co.za.